HTML TO PDF API.COM - Best api to generate pdf files from html pages! Our mission is to provide best quality HTML to PDF API service for developers, so they could build high class applications for mobile or desktop devices. We encourage you to build extensions, apps or any other software with our API service. If you have any questions, please leave us a message in contacts form. This high class HTML to PDF service is build on WebKit, which is developed by Apple, KDE, Nokia, Google, RIM, Palm, Samsung and others. You get 75+ different settings to choose from to make your your pdf coversions just like you want it to be! Our mission is to provide best quality HTML to PDF API service for developers and high class tools for users. If you find this service helpfull, please consider donating. Help us keep this service free! Looking for an API with guaranteed uptime, unlimited throughput and custom HTML support? 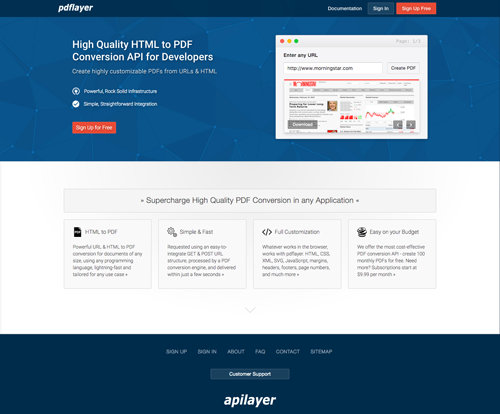 Our partner, pdflayer, has a premium HTML to PDF API with a Free Plan.